Located on a hilltop in the posh neighborhood of Ulus, Sunset Grill & Bar is awe-inspiring both with its food and its stunning views. This longstanding fine-dining venue offers international and Japanese cuisines at its finest in addition to a few select Turkish dishes. The sushi bar and Chef Takemura’s specials are unquestionably outstanding and are the highlight of Sunset’s menu. Sunset also has one of the largest and most extensive International wine lists, with rare and expensive items alongside the more moderately-priced ones. Cigar selection is also available. The brasserie concept, launched in 2015, introduces sophisticated Mediterranean flavors to the business lunch offer. Chef Fabrice Canelle’s menu, including daily specials for the whole week, features a variety of salads (quinoa, arugula) and fish (eel, salmon), as well as great choices of steak cuts, all served until 3pm. In the afternoon, the brasserie’s cozy setting turns into a futuristic bar. 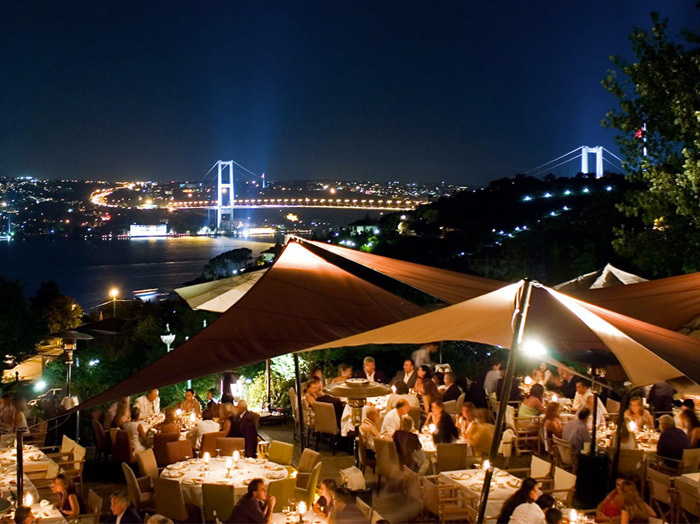 Sunset is definitely one of the best that Istanbul has to offer with its delicious food, great service, and spectacular views of the Bosphorus, enjoyed from the garden. It is an excellent choice for a business lunch, a casual afternoon with friends, or an exquisite dinner. All items from the restaurant are also available at the bar, while a special bar menu with such delicacies as duck spring rolls or grilled lamb satay are also present for sustenance.